We’re Opening a Bureau in East Austin at 12th & Chicon. Here’s Why. The corner of 12th and Chicon streets in East Austin. It’s no secret that Austin is growing and changing fast. In some parts of the city, it's happening more quickly than others. 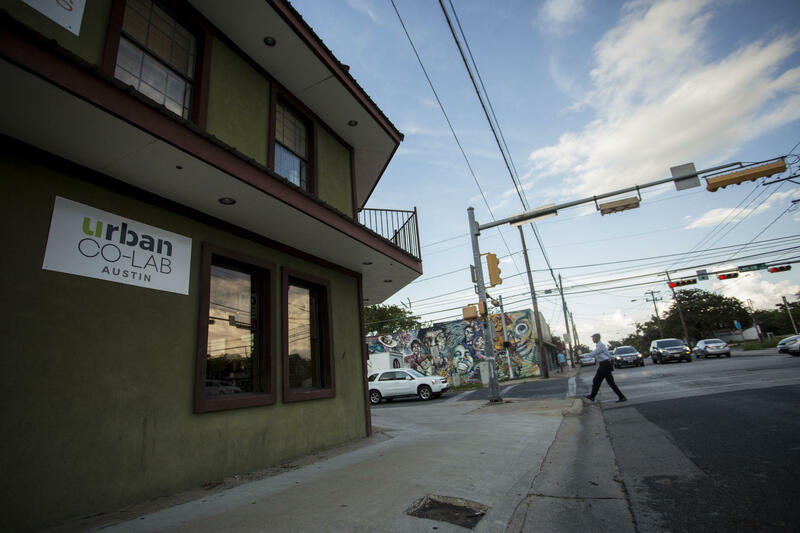 Maybe no place in Austin has seen a more noticeable transformation than East Austin. KUT Managing Editor Matt Largey speaking to Jimmy Maas about our new project, On My Block: Voices from 12th and Chicon. The changes there have remade virtually everything about the neighborhoods east of I-35. From rising property values to changing demographics (though in recent years some of those trends may have begun to shift) – the people who work and live in this area experience these changes in dramatically different ways. This fall, KUT News is setting out to tell the stories of people who are on the front lines of these changes – and tell the story of what happens when a place becomes valuable to a new group of people. Specifically, we’re going to focus on the neighborhood around the intersection of 12th and Chicon Streets. Decades ago, it was a center of black life in East Austin. People with longstanding connections to the neighborhood recall a time when it was a tight-knit community and a hub for black businesses. In the 1990s, though, it declined and the corner developed a reputation as a hotspot for crime. Drugs. Prostitution. Violence. But in recent years, it’s changed again, as police have cracked down in the area. But the changes come at a price. Longtime residents – specifically, African-American residents – continue to move out of the neighborhood as property values rise. That’s decimated a community that was once a vital part of Austin in general and this neighborhood in particular, even as a new community has grown in its place. It's this story we plan to tell in our series On My Block: Voices from 12th & Chicon. KUT's first bureau is at the Urban Co-Lab co-working space at the corner of 12th and Chicon. Typically, reporters in any medium don’t spend a huge amount of time in the communities they report on. They show up for a couple of hours – maybe a day or two, if they’re lucky – and then leave. They usually arrive with a story already in mind. We’d like to turn that on its head. Today, we’re announcing KUT’s first neighborhood bureau. Last month, our reporters started working part-time out of the Urban Co-Lab co-working space at 12th and Chicon. By maintaining a presence in the neighborhood, the goal is to allow residents to see us face-to-face on a daily basis, allow them to tell us what stories need to be told and develop deeper relationships with sources that know best how their own lives are affected by the forces of change that are prevalent throughout Austin. Our plan is to devote our resources to reporting on those changes – through the eyes of the people who are living them. For the next few months, we’ll work out of the neighborhood, hearing from longtime residents and newcomers alike. If you live in the neighborhood and have a story to tell, drop by and see us. You can also follow our reporting at our series website. Editor's note: The headline of this piece has been changed. After speaking with some readers, we've come to agree that the reference to "Austin's most notorious drug corner" in the previous version of the headline was reductive and did not reflect the complexity and full history of the area. Austin’s trolley cars, which retired in 1940, stopped at East 12th and Chicon streets. It’s there that Ada Harden and her brother would hop on, pay the five-cent fee, and ride with little concern about a destination. The intersection of 12th and Chicon streets is associated with the sale and use of drugs, but soon it could be home to a different kind of retail altogether. The Chestnut Neighborhood Revitalization Corporation (CNRC) is a nonprofit affiliated with the area's neighborhood association. Today, it began the demolition of a building just steps away from the corner to make way for mixed-use structures that will house stores on the ground floor and residential units above. Two other buildings between 12th and 14th streets are slated for the same makeover. The developments will make up a project called the Chicon Corridor.